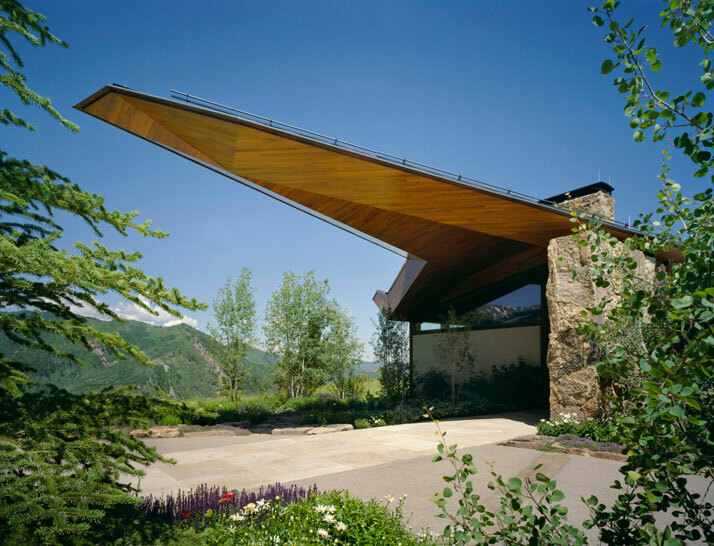 Structural Engineer: Weidlinger Associates, Inc.
New York City based Voorsanger Architects has designed this unique residence - The Wildcat Ridge which is located at an elevation of 9,200 feet in one of America’s most spectacular destinations; Aspen, Colorado. Named after the abundance of aspen trees in the area, the city of Aspen itself draws in upscale tourism from all over the world due to its excellent skiing and glamorous tourist infrastructure. 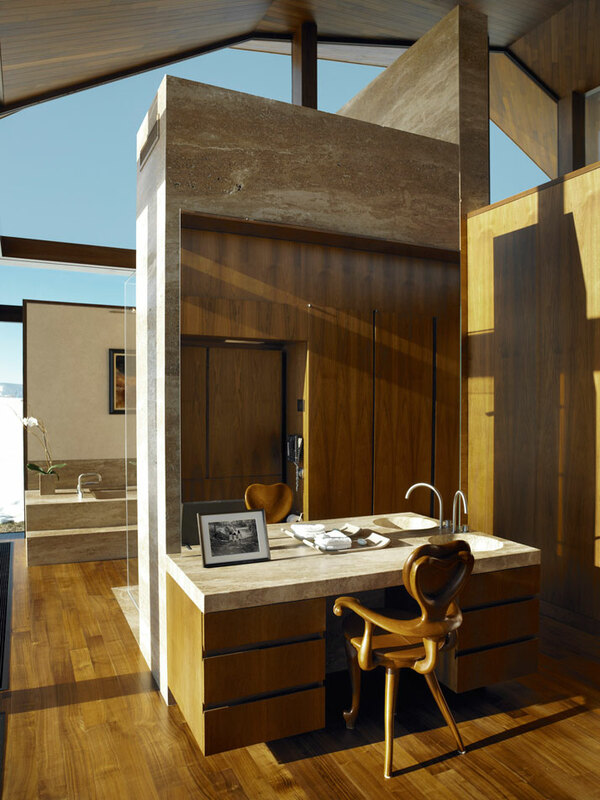 The residence’s 200 acre plot runs parallel with the crest of the mountain ridge, where unique views of the surrounding landscape and mountains abound. However, the location of the property created a challenge in building something sustainable in such a unique climate. As the site had already been excavated for a discontinued residential project, Voorsanger Architects’ normal preoccupation with not affecting their projects’ surrounding landscape was instead, replaced with rehabilitating and reforesting the uprooted site. Further challenges along the way, occurred through providing a major sustainable architecture in such a fragile and yet challenging environment. 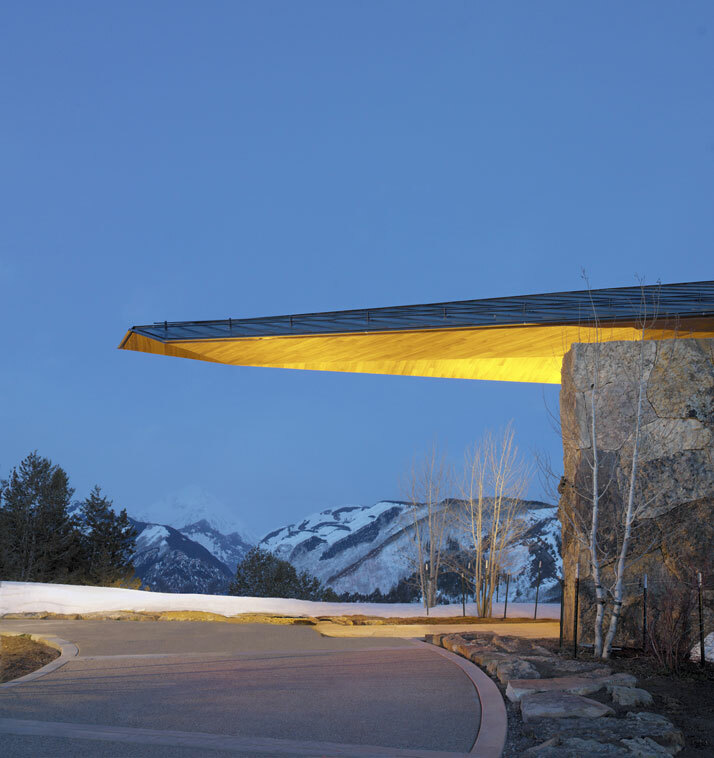 For where the landscape is itself is so dominant, spectacular, and immediate, complete with mesmerizing alpine vistas on the horizon, the design called for architecture that moved the scale of the exterior into the interior. 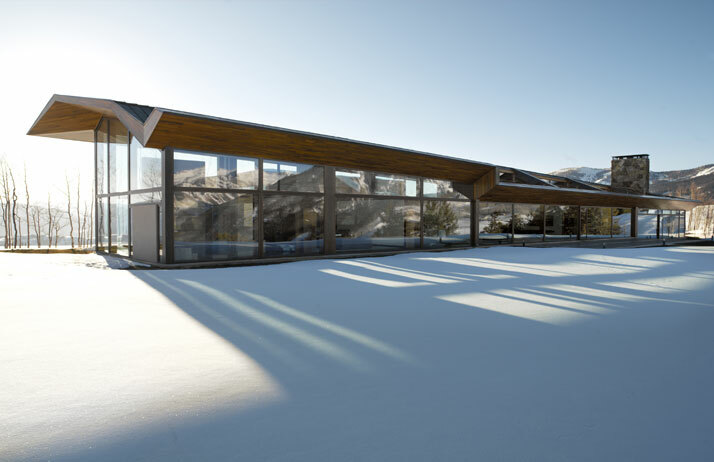 The expansive 14,300 square-foot, two-story stone-and-glass-clad private residence with dramatic folded-plate roof that supports heavy snow loads and appears to float above the west wing is undoubtedly unique design-wise both from an aesthetic standpoint as well as functionality-wise. Voorsanger Architects have indeed outdone themselves as they have successfully incorporated three major design elements which respond to and reflect the site in all of its glory: the dramatic folded plate roof, an immense moss rock wall marking the division between the building’s east and west wings, and the large expanses of exterior glass that have been used throughout. 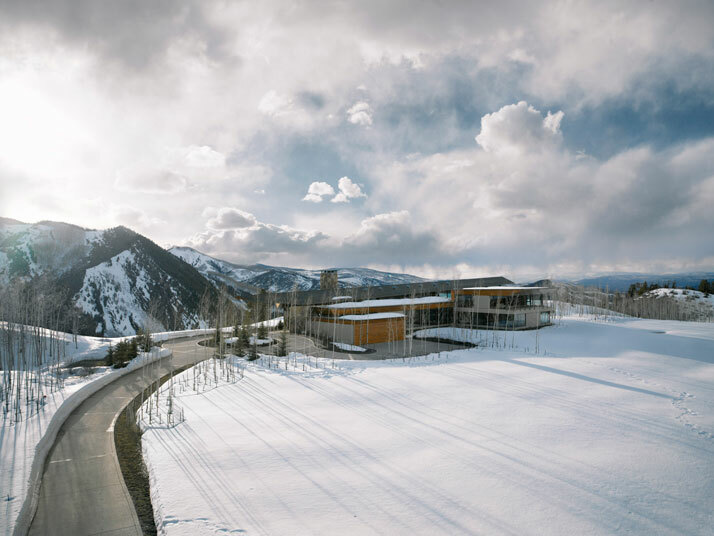 The Wildcat Ridge residence’s roof is undoubtedly one of the residence’s prime wow factors, both eye-catching as well as a real engineering feat designed to bear the heavy snow loads in the winter. Structural steel aided in making this architectural marvel a reality instead of the use of cast-in-place concrete thus reducing the cost of construction as well as providing a solution for on-site issues. Visually, the steel folded plate roof seems to hover above the west wing only adding onto the exterior glass façade. Additionally, the roof’s utilization is two-fold whereby it cantilevers forty feet over the driveway, providing much needed shade for the summer months. 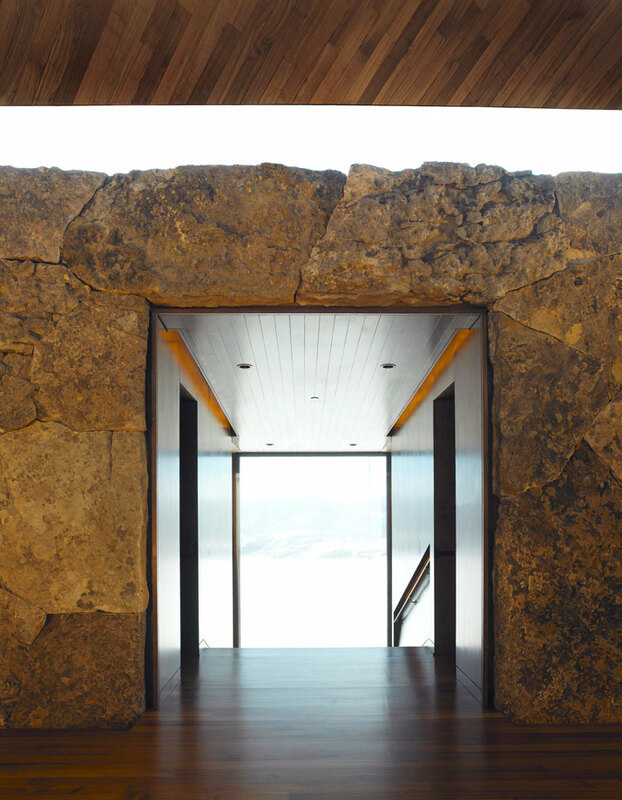 The second major design element which responds to the spectacular site is the immense twelve-foot moss rock wall marking the division between the residence’s east and west wings. 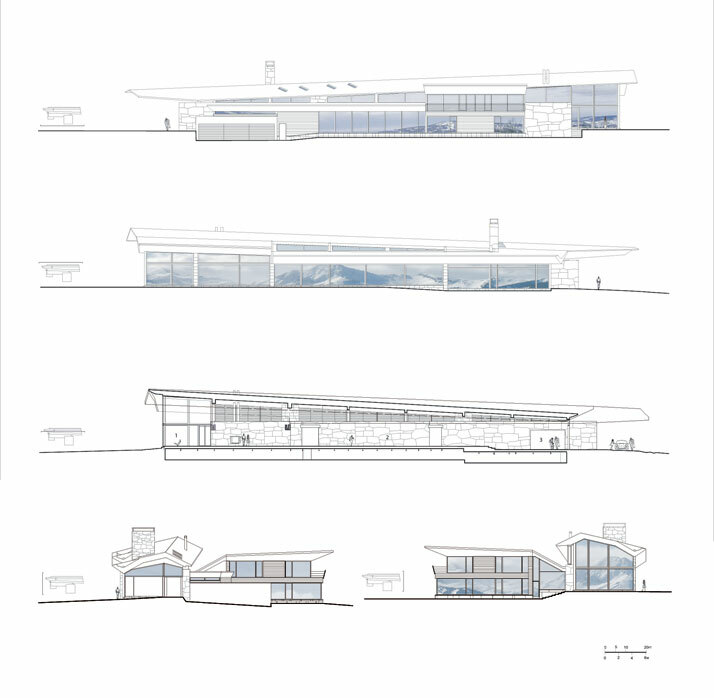 This design concept literally bisected the two hundred forty foot long house in half where the architects were inspired by the longitudinal parallel of the crest of the mountain, with the public rooms, study, and master bedroom oriented west toward dramatic views. The guest bedrooms on the other hand, have an eastern orientation with views of the receding mountain ranges. Upon walking into the house, the major rooms are on the left, accessible by a gallery parallel to the wall, on the right. This area is entirely free of columns, structured in long spans by a folded plate design with ceiling heights starting at twelve feet and ascending to a mighty thirty feet. The defying immense moss rock wall also cleverly serves to conceal the structural columns supporting the roofs, as well as the mechanical ducts. This eliminates the need for ducts within the ceiling cavity, making for a thinner roof. 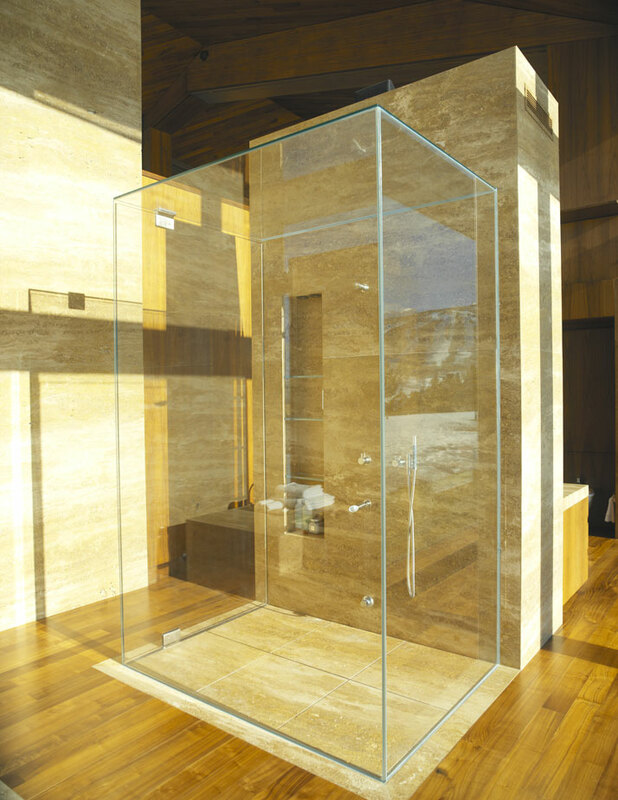 Last but not least, large expanses of exterior glass create a transparency allowing for maximum views of the surrounding mountains without necessarily competing with their scale. 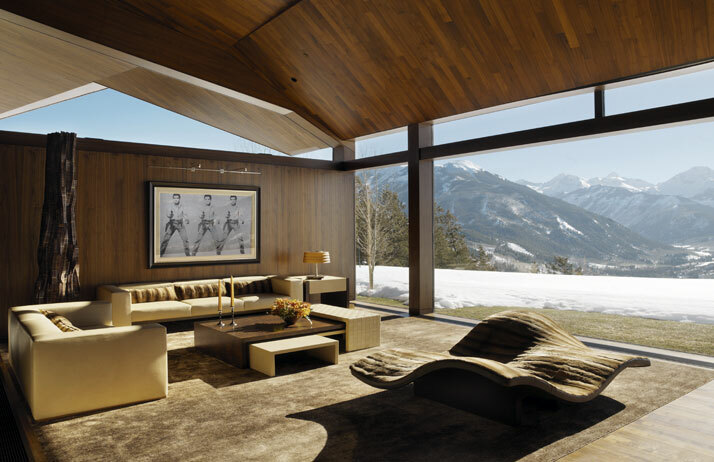 This design of floor to ceiling windows was undoubtedly one of the most significant design challenges, due to the length of the roof spans and local heavy snow loads. Of course, the large expanses of exterior glass balance out regarding the house’s energy sources which comprise of seventy-two geo-thermal wells and a generator, meaning that it can virtually function independently of outside support services. The wells themselves heat the driveways, pool, and house during the coldest winter months cooling it during the summer without sustaining any ecological burden; again emphasizing the residence’s entirely sustainable design. 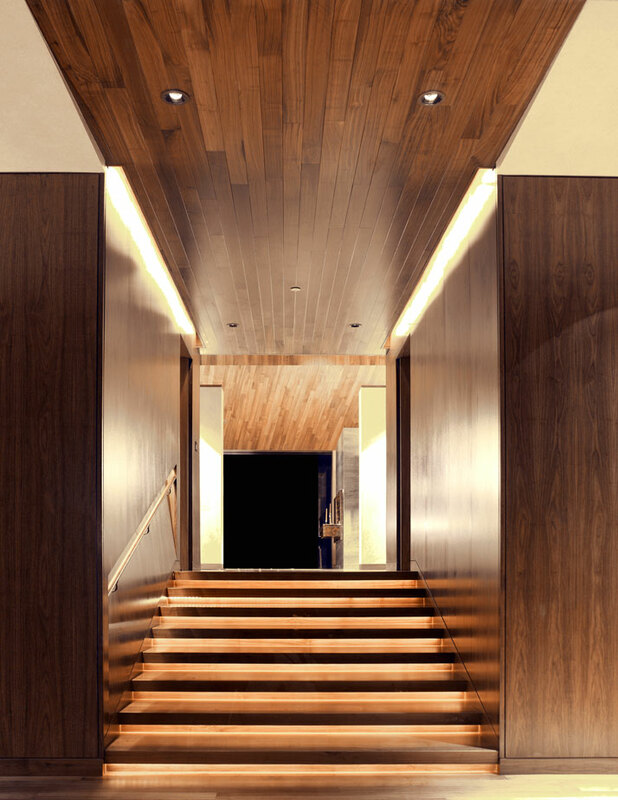 All in all, this residence is a creation where its interiors vie with the impressive exterior architectural design. 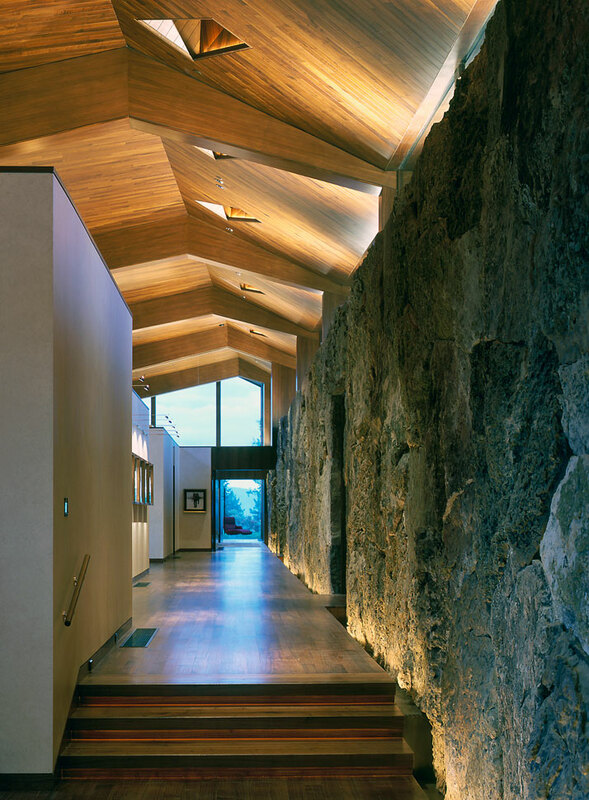 All floors, walls, and ceilings that make up The Wildcat Ridge residence are clad in black walnut, and the exterior of local sandstone and stucco to make for the mimicking of the majestic surroundings. 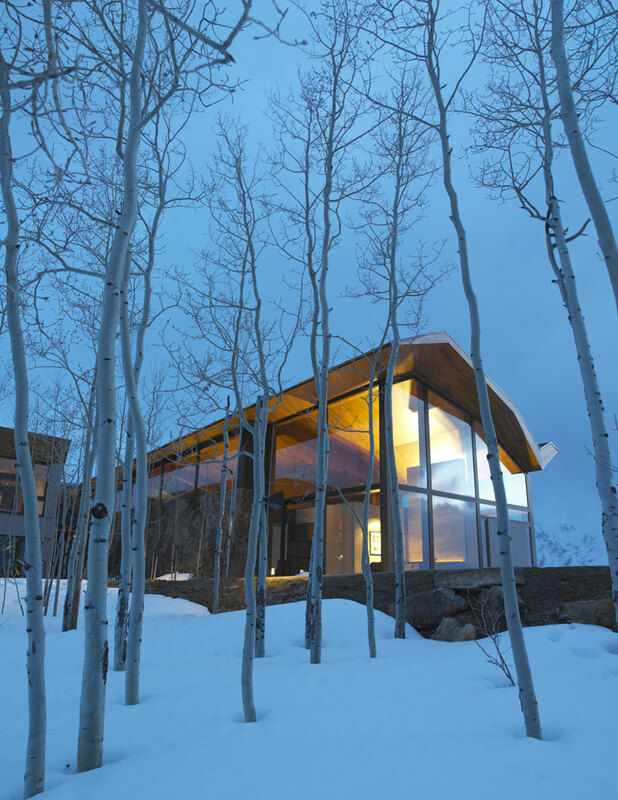 A true example of how interiors and exteriors merge where the uninterrupted glass facades create a transparency which literally incorporates The Wildcat Ridge residence into Aspen’s beautiful mountainous landscape.